The basic needs of a person are access to hot water in a residential building and pleasant temperature in it. Yet, currently, breakages usually occur in the heating or hot water supply system. They can be prevented through innovative design solutions and also the use of innovative materials. Researchers at South Ural State University have patented a heat exchange device with elements developed using polymeric hollow fibers. It has the ability to solve various problems in the heating and water supply system at the same time. Some of the problems are high production costs, large weights of parts made of metals, and their susceptibility to corrosion. “Urban water contains a large amount of dissolved minerals, which when heated, settle in a storage tank and on a heating exchanger, as well as oxygen dissolved in the water. In this regard, the storage tanks and heat exchangers in them are corroded and often do not stand the due life.” stated Yury Bondarev, author of the patent and Director of Center for Collective Use in Energy and Energy Efficiency of SUSU. There is a need for additional processing of metals or in the use of materials with alloying properties that do not rust. In addition, heat exchangers from copper or stainless steel are expensive and heavy. Plastic is low in weight, and it is not subject to chemical corrosion. Therefore, the use of heat exchangers made of such a material seems appropriate for battery tanks. It was not used this way before. The sophisticated storage device is designed to include two elements — a storage tank and a heat exchanger developed using polymeric hollow fibers. Polymer fibers exhibit a branched surface for heat exchange. Put differently, it is a bundle of several hundred small plastic pipes through which water flows. Different polymers — such as polycarbonate, polypropylene, polyamide, and so on, are used for making the fibers. 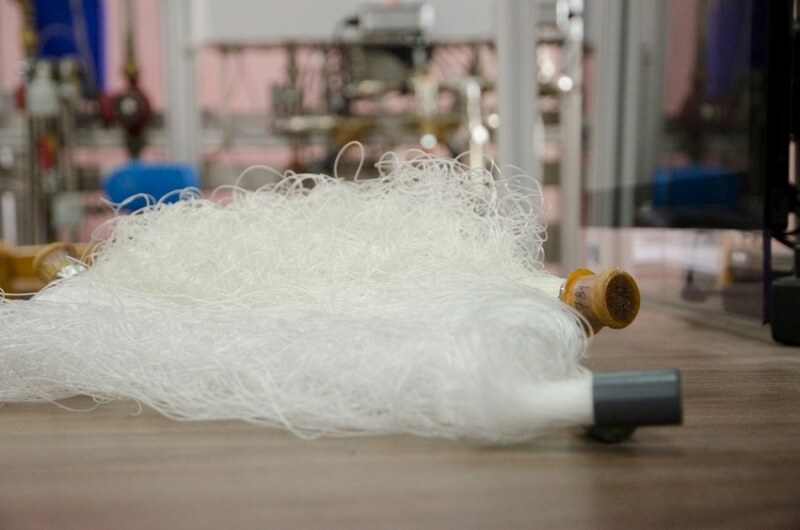 The material, length, diameter, and the number of fibers can be chosen based on the particular application. The hollow fiber bundles have low weight and are compact, thus considerably simplifying installation and maintenance. Moreover, the heat transfer process is accelerated to a large extent. The construction of individual elements and experiments were performed in collaboration with Laboratory for Heat Exchange and Fluid Flows of Technical University of Brno (the Czech Republic) and Faculty of Mechanical Engineering and Technology of University of Applied Sciences Augsburg, (Germany). At present, researchers are faced with the challenge of simplifying the process of mass production of a heat exchange device. It will not only provide the user with hot water but will also protect the heating system from being overheated. Moreover, the heating system can react more rapidly to the variations in the thermal conditions of the room: if necessary, excessive heat from the heat generator will be transferred to the hot water supply system. At present, the research group from SUSU is continuously collaborating with Technical University of Brno and Center for New Technologies in Machine Building (NETME CENTER) with the aim of working in tandem in the direction of alternative energy. We are developing a hybrid power system that will combine several energy sources: traditional (district heating) and renewable ones such as solar (solar collectors), geothermal and wind (heat pumps) and biofuel (wood, etc.). We will create an algorithm for managing this hybrid system, independently choosing the source, the use of which is currently most profitable. For example, on a sunny day, the energy of the Sun will be used, and the heat supply from the network can be turned off. The heat sources can be automatically managed or regulated by the user. The algorithm developed will be in a position to offer recommendations, the prioritized mode of operation, and the most effective operation of enabling the energy saving system to independently compare the price of each type of energy for the user.